Once you've sold your home, you aren't really under any obligation to clean it after you move out – but it is a nice thing to do. If you are renting though, then you will absolutely need to get your apartment looking presentable or else you might not get the security deposit back. How are you supposed to make time for cleaning your old home when you've got so many other things on your plate with the move? Here is a simple piece of advice: do not try to clean as you go! If you try to clean your home as you pack, you will drive yourself crazy. 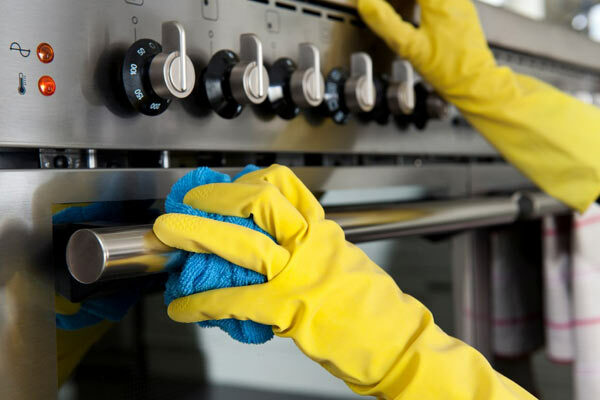 Your home will just get dirty again, which means you will end up cleaning the same spots over and over again (all that moving kicks up a lot of dust!). Instead, wait until you have moved everything out to tackle cleaning. Even better hire a cleaning company to tackle it for you. It will cost about $100 to have your entire (empty) home cleaned, but is well worth the cost because of the time and stress is saves you. In some cases, like if you are moving to a new state or on the very last day of your lease, then you won't be able to go back to fix up the place. So, you will have to deal with the annoyance of cleaning while your belongings are there (and probably everywhere!). Finish packing before you start cleaning! Again, packing will kick up a lot of dust so you will just go crazy if you try to clean and pack at the same time. Try to stack all belongings in the center of the room, away from walls. Inspect the walls and doors for any holes or scratches and fix these up with Spackle or putty. One cool hack for filling holes in walls is to rub some bar soap over the hole. The soap will fill the hole – just make sure it is a matching color as the wall! Wipe and clean all cabinets, including the insides. Have any stains on carpets treated. Most importantly, make sure that you don't cause any damage while moving! Never push furniture over wood floors because it causes scratching (lift furniture instead). Hire a reputable moving company who will put down floor and corner guards so nothing gets damaged while hauling all your belongings out.